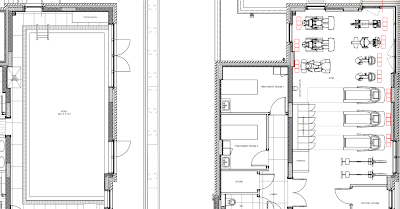 But before you buy your popcorn and get your bathing suits on, you better head down to the Berkeley Homes sales centre and get your chequebook out, because all of these new facilities will be private. 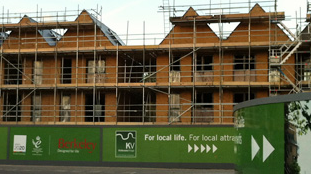 Kidbrooke Village: "For local life", but not it would seem, for local people. 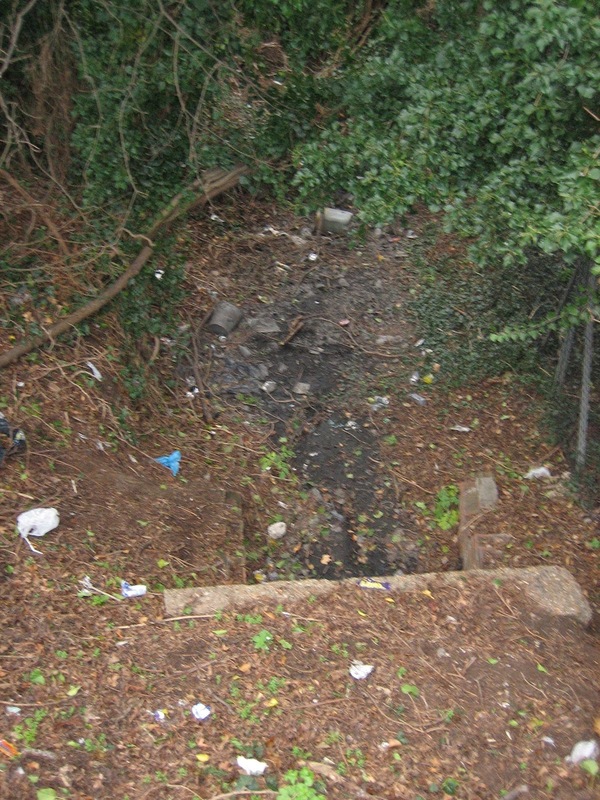 Most of the Kid Brooks were buried in concrete culverts as Kidbrooke and Blackheath were developed from farmland, but surprising amounts of it can still be found above ground. 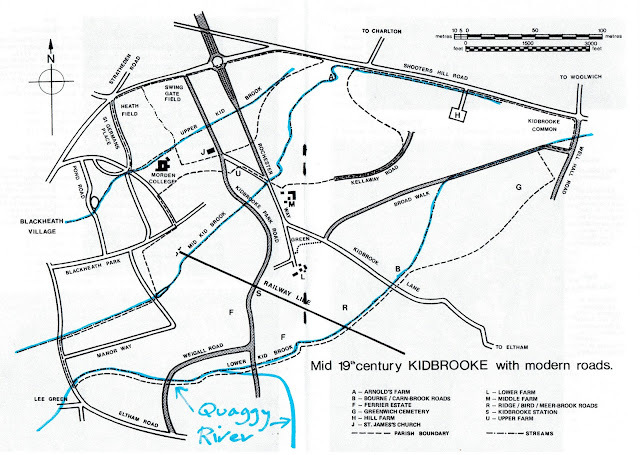 Above is a map showing the course of the three Kid Brooks kindly provided by reader Andrew. It's taken from the pamphlet Kidbrooke: Eight Hundred Years of a Farming Community, by Michael Egan. 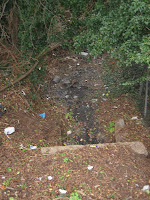 A small section of The Lower Kid Brook can still be found at the eastern end of Broad Walk running along the boundary of Greenwich Cemetry. Egan's map suggests that this wasn't quite the original route of the LKB, rising as it did at the bottom of Shooters Hill. However you can follow its course west along Broad Walk through a series of drains before it heads southwest by the Samuel Montagu Youth Centre. The brook then crosses under Rochester Way (Kidbrooke Lane on the map) near the junctions of Briset Road and Wendover Road. It continues underground along or close to Ridgebrook Road. 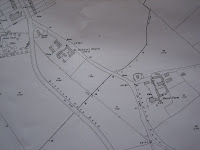 Other road names here (Meerbrook, Tilbrook and Birdbrook) suggest proximity to the brook. It crosses under the Ferrier before emerging in Sutcliffe Park, thanks to the good work of The Quaggy Waterways Action Group. The LKB then crosses west under Kidbrooke Park Road. This section appeared dry from the road, when I passed there a few weeks back (see picture right). The brook then passes south of Weigall Road before joining the Quaggy River proper. 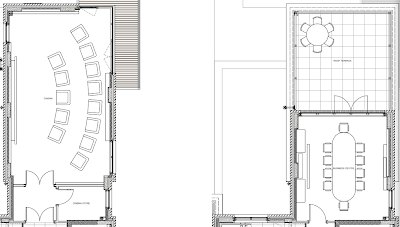 Andrew has added this to the map in blue pen above. Some confusion is caused here by another tributary seen clearly on Google Maps. Does anyone know whether this is another branch of the LKB? 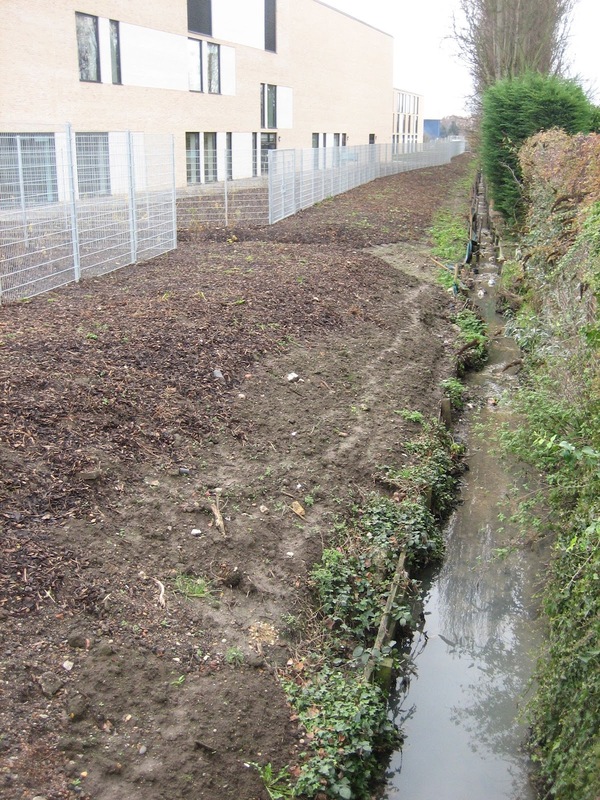 The Middle Kid Brook rises in Shooters Hill Road near the site of the old Brook Hospital. 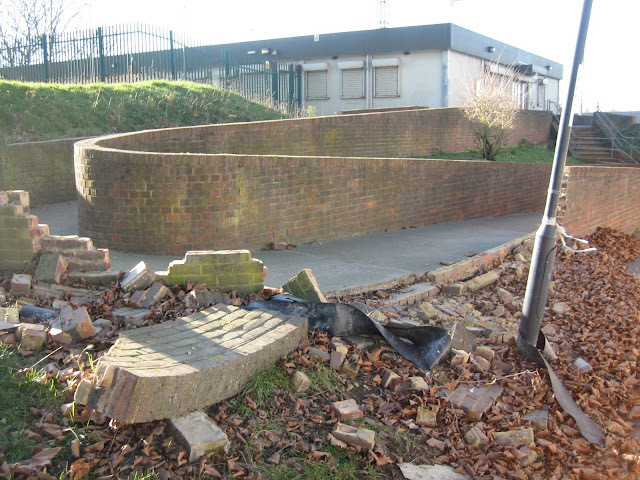 However it doesn't emerge above ground until it reaches Kidbrooke Park Road by Thomas Tallis School, some distance west. 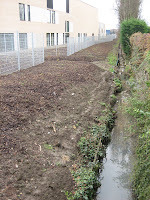 At Thomas Tallis the banks have been cleared as part of the development of the new school buildings. 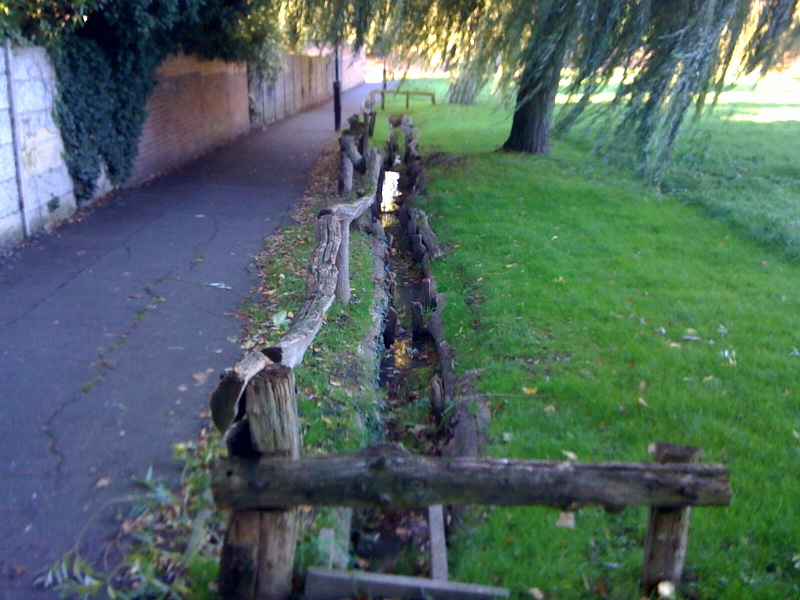 Here the Brook runs out in the open along the boundary of the school site and Blackheath High School Sports Ground. It then runs underneath the railway line and skirts the Ferrier before emerging at the little-known pond by Casterbridge Road. 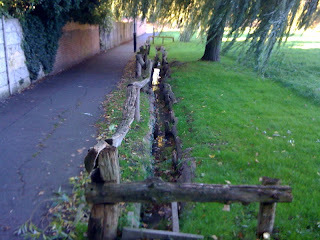 The brook then goes back into culverts and follows the route of Brook Way. 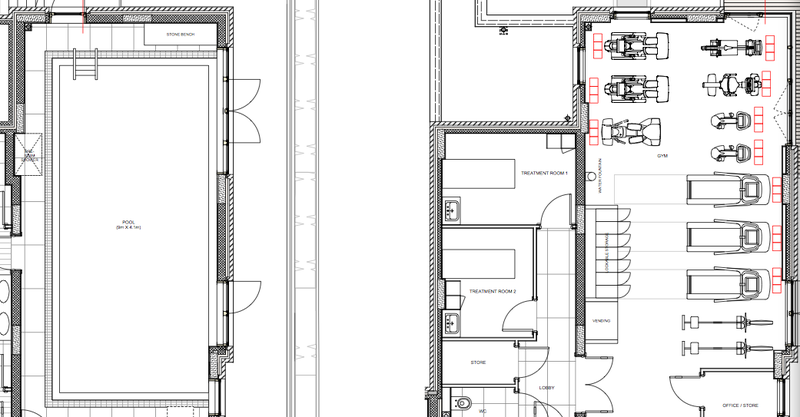 A small section emerges above ground and can be seen from Parkgate on the Cator Estate. It then joins the Quaggy further West. As far as I'm aware, none of the Upper Kid Brook remains above ground. 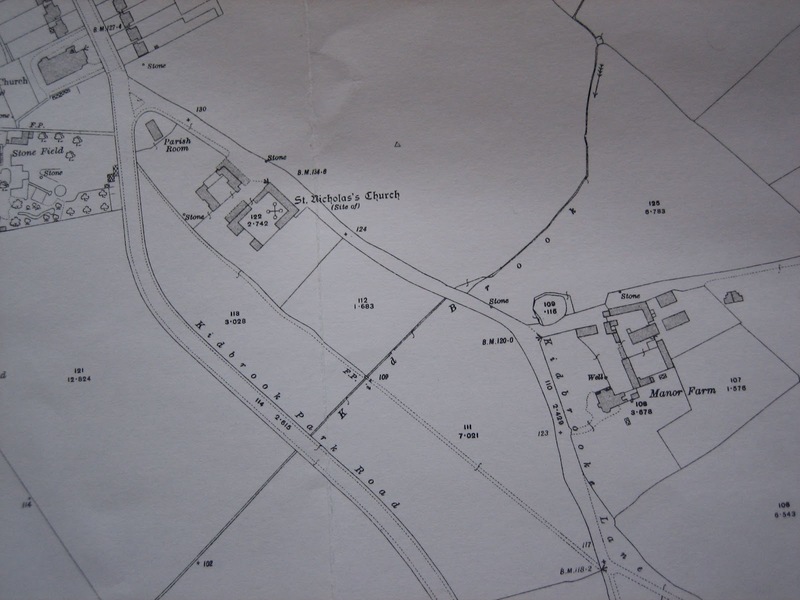 However, its course can be followed on the map above and a little extra information has been gathered by the excellent Edith's Streets website. The UKB rises east of the A2 near the Hervey Road sports field and roughly follows the course of Westbrook Road and Kidbrooke Gardens before heading southwest by the Paragon on Blackheath. It then follows a route just north of or even along the course of the railway line before filling what was once the pond which gave Pond Road it's name. From here it heads West through Blackheath to the Quaggy, although unfortunately I've yet to discover the exact course it takes. So, an incomplete guide, but the best I can do for now. 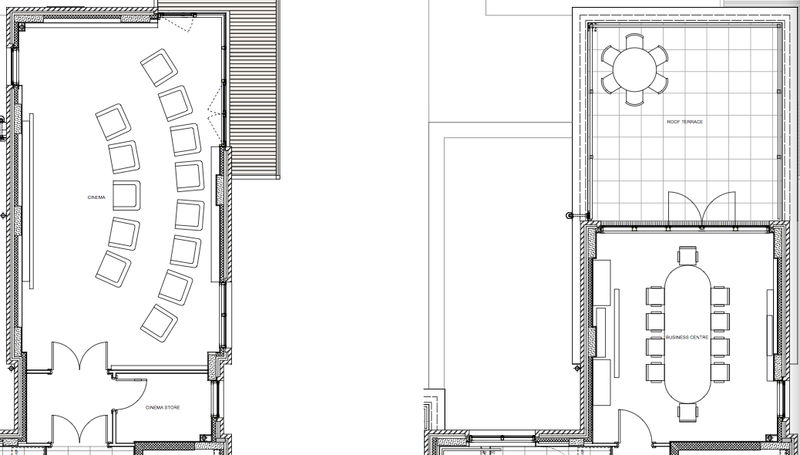 If you can help fill in any of the missing parts, then please do let me know by email or in the comments. These aren't just poorly maintained litter-strewn streets. They're *royal* poorly maintained litter-strewn streets. Sure there's no money to keep the local secondary school open or rebuild the library they're demolishing, but don't worry about that. Just head down to Woolwich tonight for a "specially commissioned film exploring Greenwich's royal connections" and a stirring speech from our dear Royal council leader. Alternatively head over to Eltham tomorrow where a man dressed as Greenwich's most famous wife-killing maniac will lead a special jig. And if all that's not enough, you can march down to Greenwich on Sunday to join a "Grand Parade" through town. Oh and watch a few more fireworks. Alternatively you can sit at home and wait for the Queen to turn up in about two months time to look at a ship. Presumably there will be some more fireworks then.